All Lali Yavari wanted for her sixteenth birthday was for her mom to come back. Instead, she starts flashing between realities and seeing people disappear before her very eyes. Then the unsettling Kai Awana shows up at school, and Lali soon discovers she has inherited the ability to astral project—with a surprising twist. When Kai offers to use his own unique ability to help Lali find her mother in exchange for her help on a misguided mission, she can't refuse...even if she's not quite sure she can trust him. Astralis is the realm Alea lies in. The Astralis people have wonderful and fantastical abilities, unique just to them. Every person can astral project, but also each individual has their own twist on their projected self. Xitali is clueless as to what she is and where she is really from. This is her journey to self discovery upon horrific circumstances. While looking for her mother whom has left without a trace, Xitali aka Lali, uncovers lies and betrayal. Will she be able to control her abilities before it's too late for her mother? The story begins three months after Lali's mother abandons her family. Just turning 16, Lali comes into her powers, but doesn't even know what is happening to her until she meets Kai. Kai shares the same heritage as Lali, and is looking for his missing sister. Together, they try to unravel the mystery of how to enter Alea undetected, and free both Kai's sister, and hopefully Lali's mother. This is the first book to what will become a series. The world building for Alea was really interesting and left me wanting to discover more. We didn't spend hardly any time in that realm because it was too dangerous for the half breeds. The background story behind Lali's mother and the other key players in the story was new and fresh for me. I enjoyed how everything came together in the end. I wasn't so sure about Kai however. In the beginning, he came across caring, helpful, and even charming at times, but then he turned into a huge jerk and was threatening towards Lali and her family. He was ugly inside, no doubt from his evil uncle, and was willing to stomp on anyone to get his sister back. I will be curious to see how their relationship develops in future books. As far as Lali's father....REALLY? His wife tells him she's from another realm and has abilities and he doesn't believe her! I'm not so sure about dad right now either. He's up there with Kai in the dog house. Lali's younger siblings however are wonderful. I love the relationship they have with each other, and when they come into their own, they shine! That family will be a force to be reckoned with! 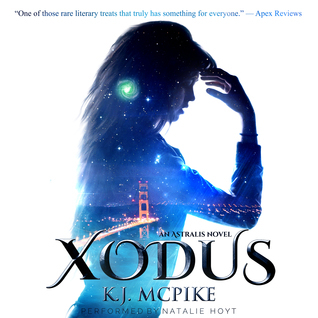 Natalie Hoyt gives us the pleasure of reading Xodus for us. She does a great job! Such a smooth rich tone to her voice, and I love the teenage angst she captures as well. I definitely give Natalie 4 Fangs for her performance!